sterling silver with limoge enamel painting. Vitreous enamel is a fine powdered glass which is painted or sifted on in layers and heated in a kiln to fuse to the metal underneath, it is a delicate process but can last for thousands of years. 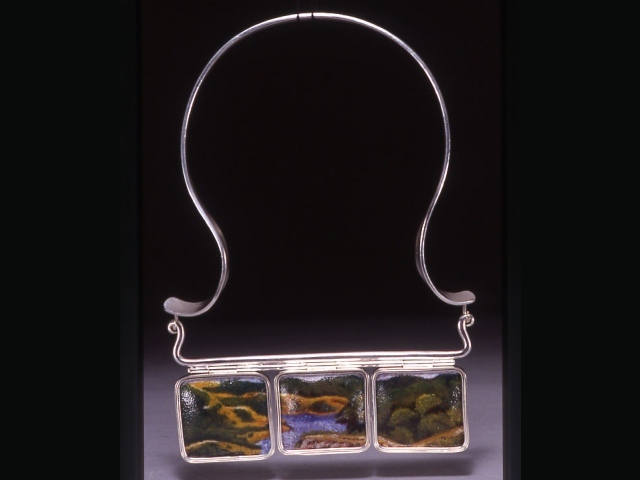 This pendant is a tryptic view of the Pinehurst Reservoir in Oakland California, Redwood Regional Park. The enamel section is about 5" across and detaches to put the necklace on.